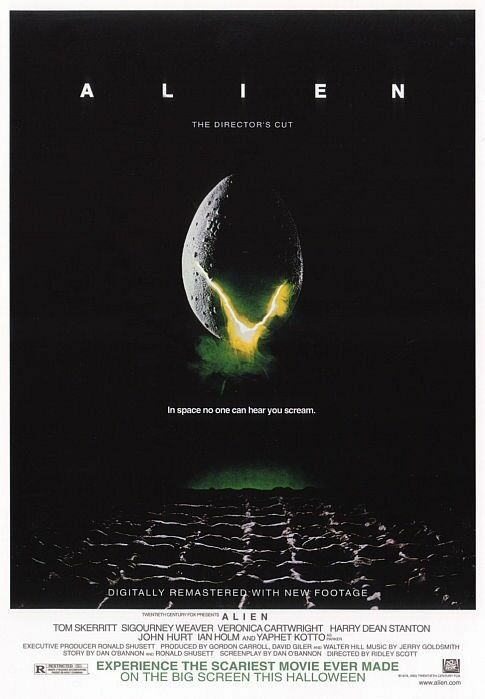 When I was first introduced to the Alien series, I saw the sequel Aliens before seeing this original from Ridley Scott. I loved Aliens so I wanted to see the first one. I was ten at the time and while Aliens is more of an action movie, Alien has its feet planted firmly in the horror genre. As a ten year old, watching Alien was not the best idea (not sure what my parents were doing letting me watch this). I got about five minutes past the iconic chest burster scene and that was enough for me. I didn’t attempt to watch it again until my mid twenties. I still love Alien, but the mental scarring I still have from my first attempt to watch this film can’t elevate it to the levels of its sequel in my opinion. As a grown up, I can fully appreciate this film as a suspenseful horror classic. It is a very claustrophobic setting and it really accomplishes getting the audience to feel like they’re trapped in this spaceship with a deadly extra-terrestrial that wants to kill them. For those that don’t know, the film’s plot revolves around the crew of a towing spaceship called the Nostromo. They are on their way back to earth and receive an SOS from a planet nearby and need to go and investigate. Three crew members (Captain Dallas, played by Tom Skerritt, Kane, played by John Hurt and Lambert, played by Veronica Cartwright) go out and survey the lost ship where they find a room filled with giant eggs. One of them hatches and a large spider like creature attaches itself to Kane’s face. Dallas and Lambert drag Kane back to their ship, and against Ripley’s (Sigourney Weaver) orders, they are let back into the ship by Ash (Ian Holm) the science officer. The crew attempt to remove the alien from Kane’s face, but it has acid for blood and can not be pried or cut off. Eventually it comes off of it’s own accord and dies. Kane wakes up as if nothing is wrong. That night, the crew are having dinner when Kane starts convulsing and an alien pushes itself out of his chest in what is possibly one of the most intense and gory scenes in cinema history. The alien runs away and starts stalking the crew one by one. This movie introduced the world to Sigourney Weaver in her iconic role of Ellen Ripley. She was one of the first strong female characters in film and opened the door for other iconic female roles like Sarah Connor from the Terminator series. Her prominence throughout the film was originally a surprise as many of her co-stars were more experienced and more well known actors compared to Weaver. She carries the film well though, and is really good at staying calm as each member of her crew goes down one by one, as well as having to deal with the double crossing Ash who turns out to be an android working for a company intent on getting the alien back to earth to use as a weapon. Perhaps the films best triumph is the alien itself. The whole idea of this creature with acid for blood that impregnates an egg in its hosts chest is terrifyingly brilliant. Then the alien hatches and literally bursts out of John Hurt’s chest. Ridley Scott does a really good job of hiding the creature during the film as it stalks the crew of the Nostromo one by one. You barely see the alien until the very end of the movie, which really adds to the creepiness of the creature. The haunting score from Jerry Goldsmith also adds to the suspense. There is not much wrong with this film. The plot is so original, even today, and all the acting is superb. The spaceship and alien effects still hold up. Perhaps if I’d been a bit older the first time I watched Alien, I’d have a better affinity for it. As it stands though, that spot in my heart is held for the sequel. I watched this movie for the first time about two years ago at Ben’s insistence. Alien had been lumped into the “possibly cheesy science fiction” category, because all I really knew about it was that it was made in the 1970s and had an alien. I also had an inkling that it was maybe scary, and not liking horror as a general rule, I had thus far avoided seeing it. Man, I really wish I had watched this sooner. Alien really appealed to me because it is reminescent of my all time favorite movie, Jaws. The primary antagonists in both are merely hinted at for most of the film. A fin breaking the surface of the water and speeding towards an unsuspecting swimmer, or a shadowy knife-like tail slowly wrapping around a crew member’s leg are enough to scare the viewer. You almost don’t want to see the creatures in their entirety, and yet, when you finally do, they are even scarier than you thought possible. That being said, it is hard for me to gauge whether or not the horror aspects of Alien have aged well. I’m incredibly easy to scare, because I tend to avoid scary movies. Example: I watched Halloween for the first time a few years ago. I was in my mid-20s, and it was 2:00pm. For a week after, I had to open the shower curtain before going to the bathroom. For me, Alien was pretty scary the first time around. It might be laughable to a more hardened movie goer. What I can say with certainty is that the entire cast is excellent, especially Sigourney Weaver. Ripley is a big improvement on the “lone girl who survives” horror movie cliche. She is smart, strong, and resourceful. (Maybe even a little too strong, but I’ll expand on that in my review of Aliens.) I even liked the cat quite a bit, and I’m not really a cat person. While some of the special effects and technology are very dated (the computer screens alone would have looked out of place by 1990), much of it still looks great. The alien especially holds up, but this is in large part due to how it was filmed. There are very few full shots of its entire body, and mostly in shadowy light. And Ben and I have already discussed decorating a walk in closet to resemble the room where Mother, the main computer, resides. I mean, it’s a room full of twinkling lights. Could be a great place to relax.